Regardless of what your itinerary is, a little planning ahead and you can be prepared for the Grand Canyon's weather. The Grand Canyon is one of the most popular vacation destinations for people all over the world. 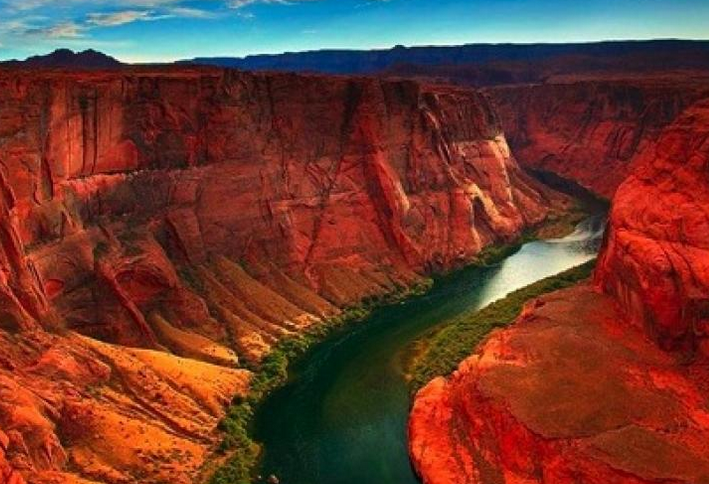 Every year, millions of people travel to Arizona to see this majestic canyon. There is a wide range of activities for the young and old. You can hike and camp out in the back country of the canyon, or you can join a tour group and take a leisurely sightseeing tour of the most picturesque spots. Choosing the right time to visit based on your expectations and abilities is important in order to fully enjoy and appreciate your surroundings. Below we explain what to expect in terms of Grand Canyon Weather both as a tourist as well as an adventurer who plans to Raft Grand Canyon. Many people like to visit Grand Canyon in the spring because the weather is mild and the air is crisp. During the day at the top of the South Rim, the weather at Grand Canyon ranges between 55 to 65 degrees Fahrenheit. Temperature can drop quickly after the sun sets. Night time temperatures can be chilly, dropping between 20 to 30 degrees and much of this is due to the elevation in Grand Canyon Village being 6,804 ft. When that sun is out during the day, it can seem like summer however the nights still have signs of winter in them. There can be seasonal storms therefore it is advisable to bring along a warm, waterproof jacket if you decide to visit in the spring. When comparing temperatures at the bottom during Grand Canyon raft trips, you can estimate about a 20 degree temperature fluctuation, so somewhere between 80 degrees Fahrenheit to a low near 50 degrees. Summer time can get very crowded as this is the peak tourist season. The South Rim is popular because not only are children and students on break from school, but the temperatures are quite pleasant, ranging from 50 to 80 degrees. This is comfortable considering summer temperatures in Arizona can reach triple digits. For example on a Colorado River Trip in Grand Canyon, some these trips require a 10 mile hike down to the river from the South Rim. This hike has a five thousand feet elevation drop, and the temperature can and does rise above 100 degrees. If you prefer cooler temperatures, the North Rim is a bit cooler. The elevation is higher yet compared to the South Rim, and in turn the air is cooler. Just remember that any attempts to hike down during the summer should be done early in the day to avoid the extreme temperatures at midday. For example, on partial Grand Canyon raft trips, these hikes begin at 4:45am when it's dark out to avoid the excessive heat which occurs later in the day. There can also be summer thunderstorms. The "monsoon season" is typically from mid-June to mid-September. Monsoon rains generally occur between July and August. Being at the bottom of the canyon on a Grand Canyon Rafting trip is a special treat during this season for a couple of reasons; the surprise natural waterfalls which occur after a heavy and short downpour of rain, as well as the cooling effects of the rain, bringing some relief to rafters who are down there during these months. Weather in Grand Canyon in autumn brings wonderful cooler temperatures, which hikers particularly like. At the bottom of the canyon, rafters enjoy cooler temperatures beginning in September through October when the season finishes. The bottom of the canyon cools down to 60 to 70 degrees at night, and 80-90's during the day, shave off another 5 degrees or so in October, a big difference from the triple-digit summer heat.For comparison's sake, April is similar to October and May is similar to September from a temperature standpoint on river trips. At the top of the south rim in Grand Canyon Village, From mid-september to mid-November, the weather is dryer. Temperature around the rims can approach freezing in the early morning hours, but the day does warm up after sunrise. Due to winter storms and heavy snow, the North Rim closes after the middle of October. A lot of people like to visit the Grand Canyon during the winter time. There are fewer crowds, no scorching heat, and great accommodations can be booked at a discount. The South Rim is open, but snow may force some roads to be closed. Sometimes a thick fog can obscure the magnificent view of the canyon. However, if the weather conditions are in your favor, the fog will lift and reveal the breathtaking views. Grand Canyon weather can change quickly. Therefore, always be prepared when you plan to venture out to the rim or go rafting. Check with the National Park Service for the latest weather conditions. Bring along a rain poncho for those unexpected thunderstorms. When you are prepared, you will have a wonderful time at Grand Canyon regardless of what the weather is like. Click here for accurate real-time weather at the bottom of Grand Canyon recorded at Phantom Ranch. For real-time weather at the south rim Grand Canyon Village. While you are in the Grand Canyon, search for and book one of our incredible rafting trips. Choose from 16 outfitters and 1,000+ trips with our amazing search tool!